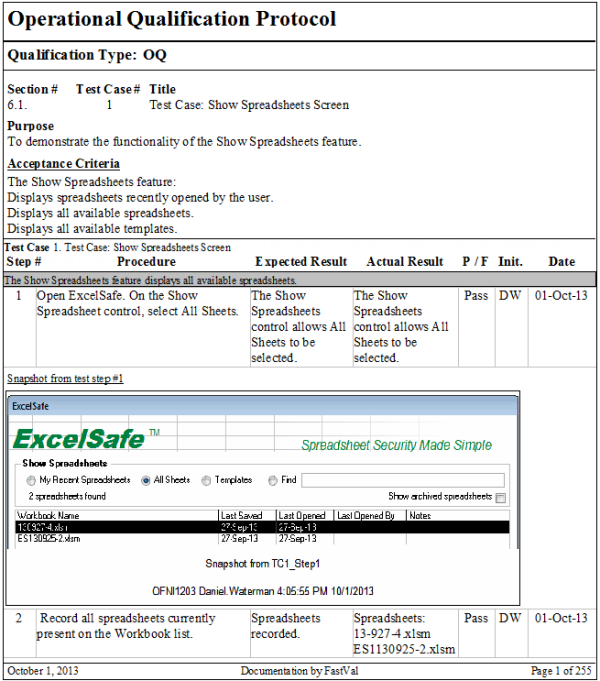 FastVal allows users to execute validation protocols electronically. As with paper-based protocol execution, testers follow the defined procedure and view the expected results of an approved protocol. With FastVal, testers document the actual result electronically through text and screen capture. Screen shots (with the Computer ID, User ID, and date/time of the screen shot) are embedded into the executed protocol. FastVal is compliant with 21 CFR 11 and other FDA requirements and GAMP 5 recommendations for good documentation practices during protocol execution. Audit trails, password protection, and other security features provide additional information and increased data integrity over paper-based validation documents. The result is a test execution process that provides you with more information about your validation testing and is more secure than traditional paper-based protocol execution. Electronic protocol execution produces higher quality validation protocols in less time than paper execution. Screen shots are instantly embedded directly into the protocol, requiring less time than collecting, numbering, and maintaining paper screen shots. An audit trail records all changes to the protocol, documenting any changes to the actual results with the exact date and time of the change. In the event of a testing deviation, deviation records are generated automatically. Electronic validation documents are more legible (no more trying to decipher handwriting) and are easier to maintain and less costly than binders of paper documentation. Electronic protocol execution provides your reviewers with more information about how long your testers take to execute test protocols and provides assurance that all test steps are being executed, in the proper order. The audit trail makes reviewing data entry during protocol execution obvious, which prevents testers from filling in results without performing the testing. Electronic protocol execution provides your Quality department with a high degree of assurance that you have total control over your validation process, and it can reduce overall time to review and approve validation protocols.